Oh man, I forgot how much I enjoy a really good, fo' serious YA novel. I read a few in the last year or two, and they were okay, but many are so focused on angsty boy-meets-girl plotlines that they felt more like fluff reads than anything else. But then I got my socks knocked off by Laurie Halse Anderson's Wintergirls, so I decided to follow that up with Ask The Passengers. GREAT CHOICE. 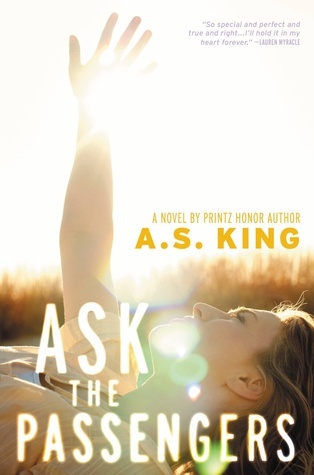 This is the first time I've read anything by A.S. King, but it certainly won't be the last! And I'm now very excited to meet her at the Rochester Teen Book Festival in May. I hereby declare that this book should be required reading for adolescents. Not just those that are questioning their sexuality, but ALL teens. Because Astrid goes through some pretty awful bullying as her sexual identity becomes more public. I sometimes lose sight of the fact that not everyone grows up in an area like mine, where views on the LGBTQ lifestyle are generally accepting. (I say generally because...as we all know, there are haters everywhere. Unfortunately.) I had friends that came out in high school, and it didn't create nearly the ripples (more like tidal waves) that Astrid has to face in the close-minded community of Unity Valley. This book is great for any teenager in the midst of their sexual-identity journey, as well as those who want to understand how to better support their friends and family members going through such an exploration. What makes this stand out in YA LGBTQ literature? Number one is Astrid. She is such a great character. She's often snarky and sarcastic, despite the difficult issues she's constantly facing. Plus, her frank discussions about sexuality are refreshing (and the primary reason why I think all teens should read this). I love her habit of "sending love" to the passengers of airplanes that she sees flying above her. At first, I didn't know what to make of that ritual, but I like how King uses it as a way to explore the relationship problems that many of the passengers themselves are facing (she often segues to little side-stories about the passengers that Astrid has "sent her love" to). This whole idea gives the book a unique premise, something more than your average YA novel. Readers: have you read any other books that tackle teen LGBTQ issues in a powerful way? However, as the story unfolds, it becomes obvious that Muriel still has plenty of insecurities and doubts to overcome. As more of her family's secretive history is revealed, she has to continually rework her vision of herself among her parents and siblings. Even though the end result is rather empowering, still...I was sad. Not sure I've ever seen a female character more emotionally beat down by her family than poor Muriel. I don't mean to scare you off by putting that nice dark cloud over Muriel's life. Actually, as her interactions with her family became continually more heart-wrenching, I found myself reading faster and faster. It's hard not to be sucked into her story. You want Muriel to triumph in the end, and there's always another little family mystery to uncover, so to call this a page-turner is entirely accurate (if admittedly cliched). In my experience, family dramas can sometimes move a bit too slowly, primarily because the author spends extra time on minute details of the family background. However, in Two Sisters, every detail is compelling. Every chapter gives you something new to mull over. And if you ever thought your family was kinda messed up, I invite you to sample Muriel's world...she might have you beat. Check out the other blogs on this book tour HERE. 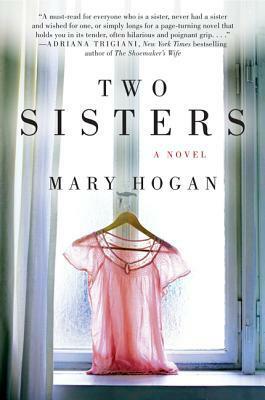 And connect with Mary Hogan on her website, Twitter, and Facebook. I was going to start off by telling you that this novel is "heavy" reading, then realized that could be seen as inappropriately punny. So please trust me and take it in a completely no-pun-intended way when I tell you this is HEAVY STUFF. I read Anderson's Speak many years ago, and I remember thinking that it was especially hard-hitting compared to other YA novels I had read. I get really turned off by young adult novels that are too fluffy or romance-based, probably because I know that when I was a teen, that didn't feel reflective of my age bracket. Adolescence seemed to carry more importance, and as an adult, I like it when YA authors have an appreciation for that feeling. Anderson is one of the authors at the Rochester Teen Book Festival this year, so I decided to delve into another one of her books before the event. Wintergirls gets fantastic reviews, and now I know that it's for a very good reason. Anderson certainly has a talent for shining the light on difficult teenage issues, in a way that provides good reading for both YA and adult readers. What stands out here? Tops would have to be the imagery in Anderson's writing. Her use of metaphors/similes is impressive, because done the wrong way, they could make the novel seem like it's trying too hard. Instead, the way they are inserted in Lia's internal dialogue makes her words feel more...true, in a way. They illustrate exactly how much her anorexia is making life crumble at her feet. But the core of Anderson's success here is simply the clarity with which she is able to write about anorexia and bulimia. This is, without question, the best fictional account of eating disorders that I've ever read, the one that has the truest understanding of those conditions. When I say that this book could be life-changing for teenagers struggling with body image issues, I am not being grandiose. That's a fact. Wintergirls is easily one of most outstanding YA novels I've read in a very, very long time. Get on it! Readers: have you read any other books that tackle eating disorders in a powerful way? Book Heaven. I FOUND IT. First off, I know...I've been a not-great blogger lately. You've heard all my usual excuses, I won't repeat them, but I promise I am still here, and reading, and loving you (even if I am flippin' horrible at responding to comments right now). Anyway, a quick post is in order because I have located BOOK NIRVANA and I had to make sure you all knew about it. This past weekend, I went to New York City for the day for my friend Liz's bridal shower. It was a whirlwind trip. Woke up at 3:45am, fed the baby, left the house by 5am, drove 4.5 hours to the train, took 2 hour train ride to Grand Central, arrived 12:15pm. I had just over 2 hours until the shower, but it was way downtown and I still needed to find some food, so I didn't have a ton of time to sightsee. Thus, I was left wondering: what cool NYC locale is situated between Grand Central and SoHo, that I haven't already seen, where I can spend maybe 45 minutes before this shower? 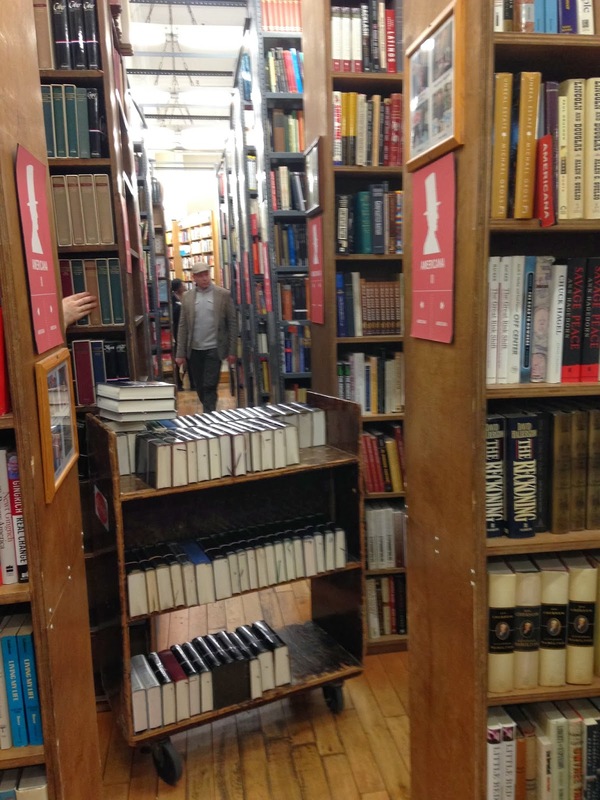 I'd never been to Strand Bookstore on Broadway, so I felt a visit was in order. And OH MY STARS, PEOPLE. JUST OH MY STARS. 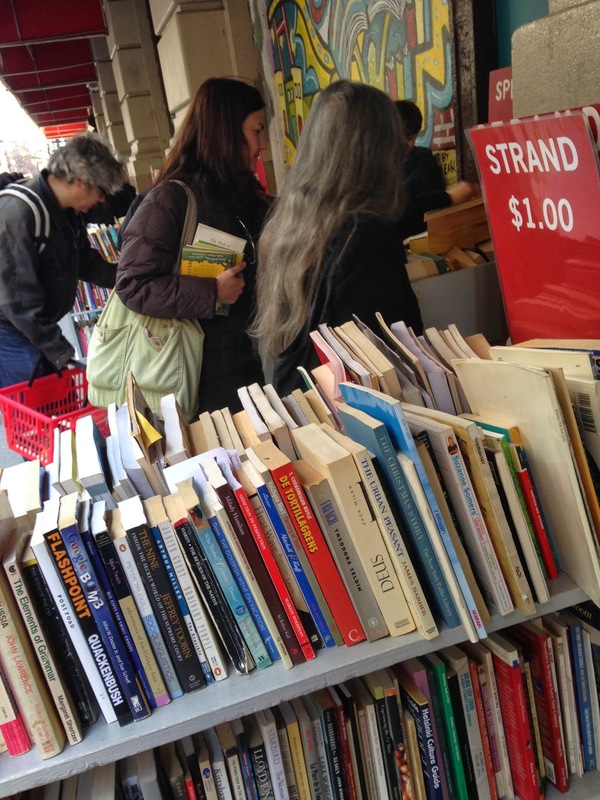 I walked there, and first thing that hit me was the racks and racks of used books lining the outside sidewalks of the store. Nothing over $2. I just about died right there. Just thousands and thousands of this. But then you go inside, and it's three stories of pure amazingess. This does not do it justice, but I was too book-drunk to take more pictures. New books, used books, rare books. Floor-to-ceiling. Three floors. I quickly realized that 45 minutes was not enough time. NO TIME WOULD EVER BE ENOUGH TIME. I frantically browsed in the time that I had, and managed to find 5 good discount books for myself, plus a cute new kid's book for Small Fry. And a Strand t-shirt for me, because swag. How I long to return here for hours of book-related fugue state. As followers of this blog know, it's a big goal of mine to read down the massive pile of books from my at-home TBR this year. This means less NetGalley surfing and more home-shelves selections. But then NetGalley goes and sends me an email telling me all about Sous Chef, and I'm like, "FOODIE NONFICTION, GET IN MAH BELLEH." Couldn't help myself. Had to review. I've read my fair share of books that take place in professional kitchens, but Gibney manages to make his POV unique. 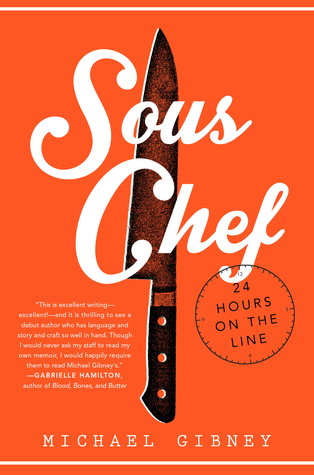 He takes you through a full 24-hour period in the life of a sous chef in a Manhattan restaurant--presumably based on his own experiences as such. It's written in the second-person, which you don't see very often, and in this case, it immerses you in the action of the kitchen from page one. Despite that, I did have some reservations about the book when it first opened. The beginning (when Gibney is walking you through the preparations for dinner before customers arrive) felt a little "textbooky" to me: a lot of very specific explanations about cooking techniques and sanitation regulations, which got bland after a while. However, once the restaurant opened for business, I was transfixed. Honestly, it left me rather in awe of the skill and synchronicity of the cooks in that kitchen. I've read a lot of foodie nonfic, and I have a fairly good understanding of how difficult professional cooking can be, but this is the first book I've read that really brings you through that entire process, soup to nuts. (Pun intended, because I am lame.) The precision and attention to detail of these chefs is truly impressive, but is also balanced by the reality of how tough their jobs are, both physically and mentally. The last part of the book focuses on after service--when the chef leaves the restaurant, goes out to get drinks with his fellow chefs, and later returns home. This part of the book lost me a bit. Gibney gets too overly poetic here, as he reflects upon how difficult it is to balance his job with his personal life. His basic point is that this is a very demanding line of work, one that requires much of you and forces you to closely examine your priorities in life. I can appreciate that. However, I could have done without the over-the-top philosophizing, complete with contemplations of the moonbeams shining down on him as he walks home (yes, this was a thing). It felt like he was trying too hard, and the points could have been made more simply. Before Service: interesting and draws you in, though perhaps a little overly technical at times. During Service: absolutely stellar, will leave you in awe of both the skill and difficulty of professional cooking. After Service: makes some good points, but tries too hard to wax poetic. Sous Chef is being released March 25. Have you read any great 2014 releases yet this year? Wow. WOW. I am currently sitting in Starbucks, where I just finished Above as I was sipping my coffee, and now I'm looking around the cafe like...DID ANYONE ELSE JUST GET THEIR WORLD ROCKED BY A BOOK? No, that was just me? Sigh. I couldn't help asking for an ARC of this book, because the reviews draw parallels with Emma Donoghue's Room--a novel that captivated me, but also one that is very unique in its premise, so I was hopeful that Above would finally give me something similar. Honestly, the comparisons to Room are not entirely justified. The novel centers around Blythe, who is kidnapped by an "extreme prepper" who locks her in a missile silo, convinced that the world will soon come to an end and they will one day need to repopulate the earth together. The captivity theme is pretty much the only way that Room and Above can be compared. After Blythe gets locked in the silo, her journey becomes very, very different from the one that Jack and his Ma go on in Emma Donoghue's novel. So no, I won't be reviewing Above in comparison to Room, because it would be doing Isla Morley's novel a disservice...and Above is amazing all on its own, without need for comparison to anything. Above is the EPITOME of not judging a book by its cover...or in this case, by its book jacket description. My predictions for how this novel would progress (and eventually end) were entirely, completely, unabashedly WRONG. Remember when I reviewed Gone Girl, and I said that I finished Part 1 and it was like the whole world exploded? ABOVE IS LIKE THAT. The book starts, and Blythe is abducted, and then after a while, I was like, where is this going? I can only read about Blythe's years worth of struggles with her captor for so long, and I still have 70% of this book to finish...? And then, BOOOOOOOM. Major unpredictable game-changer midway through the book that changes your entire perspective of everything--Blythe, her captor, and really the whole central purpose of the novel. Above does have its slow parts. As I mentioned, the beginning portion of the novel started to drag for me before the plot got flipped on its head. And towards the end, I started to feel the same way. I think Morley tended to dwell on certain parts of Blythe's journey just a tad too long. However, each transition in the plot action was good enough that I was able to forgive the slow bits pretty quickly. Readers: have you read any books lately that went in a completely different direction than you originally anticipated? The Sunday Post is a meme hosted by Kimba @ The Caffeinated Book Reviewer. It's a chance for book bloggers to share what's going on with them this week, any new book-related news, etc. This week, I'm combining this with my monthly wrap-up for February. Guys, GUESS WHAT I AM DOING RIGHT NOW. That's right. 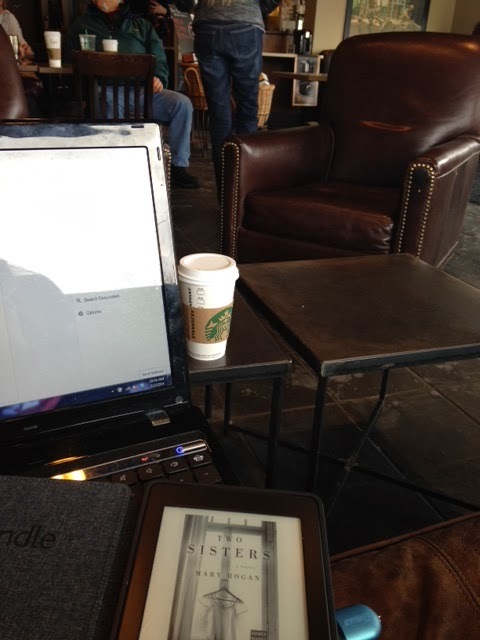 I'm in a Starbucks, drinking coffee, reading my Kindle, and blogging. ALL BY MYSELF. (I mean, mostly by myself. There's a real pompous windbag here (you can see his jeans over the corner of my laptop, hi annoying dude!) who's been going off about Obama and socialism for the last 45 minutes, but whatever, you know what I mean. ALL BY MYSELF! And I'm going to the mall after this! ALL BY MYSELF!! My awesome husband kicked me out this morning and offered to have a "boys day" with Small Fry and Tater Tot so that I could have some much-needed alone time, and my God, IT IS GLORIOUS. Well, as you can see, I don't get out much these days. :) But life is good here in Well-Read Redhead land. We had a bit of a hiccup early in February, when Tater Tot got a cold and then suddenly ran a huge fever and was rewarded with 48 hours in the hospital (ugh), but otherwise, I feel like I'm getting the hang of this whole mother-of-two thing. I also started running again, which has been great (ALMOST fitting into my pre-pregnancy jeans) and I'm really looking forward to the weather breaking so that I can ditch the treadmill and enjoy the great outdoors. Bring on SPRING! I also did a Small-Fry Saturday with Dragons Love Tacos by Adam Rubin, participated in the Literary Blog Hop, and talked about my love for short-and-sweet novels. Coming up in March...I only have 1 book tour scheduled. Otherwise, I have a couple ARCs that I can't wait to get to (seriously, didn't I say I was going to read fewer of them this year? I have a problem), and I'm planning to start Gone With The Wind as my next TBR Book Baggie pick. I'm also trying to make my way through some of the books I bought for the Rochester Teen Book Festival, coming up soon in May! I am taking a long (LONG) road trip for my friend Liz's bridal shower next weekend, so I'm looking forward to getting lots of audiobook reading done then as well. How was your February, reader friends?